The Elizabeth Williams School-Dance is located at 128 W. Grand River Ave.
To Elizabeth “Liz” Williams, dance is much more than a passion. It’s a lifestyle. When she was in junior high, Williams knew she wanted to share that lifestyle with others. So in 1992, she opened the doors to the Elizabeth Williams School-Dance in downtown Williamston. 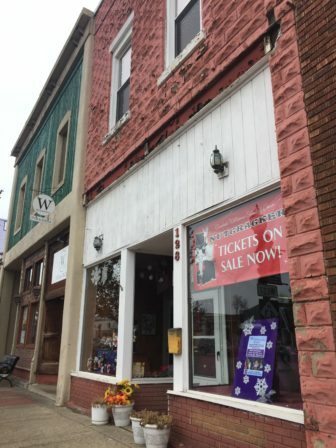 Williams fell in love with the old buildings in Williamston, a community that she was familiar with prior to opening her studio. The building she chose for her dance school at 128 W. Grand River Ave. boasts high ceilings and strong wooden floors, perfect for dancing. Now, nearly three decades later, the Elizabeth Williams School-Dance continues to pass on the lifestyle and art of ballet, tap and jazz dance. Williams loves that she can help her own business thrive by utilizing other businesses, promoting the idea of staying local in Williamston. When Williams isn’t teaching at her studio, she takes the short journey down West Grand River Avenue to Groovy Donuts, where she works part time. “It’s a cool little joint in a cool little town,” said Lucas Howe, an employee at Groovy Donuts. One of the things Howe admires most about the Groovy Donuts location in Williamston is the overall sense of community. In addition to the atmosphere, Howe appreciates how dedicated and involved the owners are in the community. They support different school fundraisers and even donate leftover donuts to different organizations instead of throwing them away at the end of the night. These businesses are what keep the town bustling, as Schmidt explained. The overall relevance of a business in the area is another factor in determining its success. An established business in Williamston is Barrett’s. The clothing store has been around since 1928, and has continued to be family owned and operated through the years, providing workwear brands such as Carhartt and Levi’s to the people of Williamston. Martin became the owner of Barrett’s just three years ago, and since then, he has added a women’s section to the clothing store. Since the addition of the women’s clothing section, those sales now make up about 26 percent of the business. Martin continues to keep Barrett’s involved in community events such as the Red Cedar Jubilee Duck Race and Alleyfest. “It’s something that has survived for 90 years when most businesses in Williamston haven’t,” Martin said. Businesses like Barrett’s are authentic and important to the community. Located on the north side of Grand River Avenue, the Williamston Pub & Grill, once known as the Bucket, received an upgrade when Leigh Baumgras and Luciano “Chano” Loredo became owners in 2016. The partners gave the bar some much-needed cosmetic updates, making it a more family-oriented atmosphere. The Pub & Grill has become more popular since its transition into new ownership, Loredo told Spartan Newsroom earlier this fall. Another business brewing in Williamston is the Old Nation Brewing Company. The brewery has been around since 2015. It found its niche in brewing beer that is authentic to Michigan. Their most popular beer is M-43, which is ranked in the top 15 best beers in the state, according to Beer Advocate. Old Nation is a prime example of keeping business local and not turning to large producers. It’s a reason for people to come into town. After passing Old Nation headed east into Williamston, there’s a high-end pet store that offers locally-made products. Marquardt began working at Joey’s in 2015, 10 years after the store had been established. He became the owner on Jan. 1, 2018 after buying the company from the previous owner. What drew Marquardt to Joey’s was his love for animals and 16 years of experience as a zookeeper at Potter Park Zoo in Lansing. His passion for caring for animals has continued throughout the years, and he applies his passion to the business. Joey’s was named 2018 Business of the Year in Williamston by the Williamston Chamber of Commerce. Groovy Donuts has numerous locations around Lansing. Elizabeth Williams also works part-time at the Groovy Donuts in Williamston. Groovy Donuts employee Lucas Howe describes the location as "A cool little joint in a cool little town." The donut and coffee shop has a 1960s-style feel to it. The tables have 1960s slang on them. There's a Groovy Donuts located in East Lansing as well. Part of the reason people love Groovy Donuts is because of the nostalgia, Howe believes. Howe has been working at Groovy Donuts since August. Something that Howe admires about Groovy Donuts is that they make their donuts in a "donut connoisseur" way. I am currently a sophomore in Michigan State's School of Journalism. LANSING — The White River Light Station in Whitehall might never have existed had it not been for the dedication of Capt. William “Bill” Robinson III. Robinson moved to the the area in the 1860s with his wife, Sarah, and seven of their children.